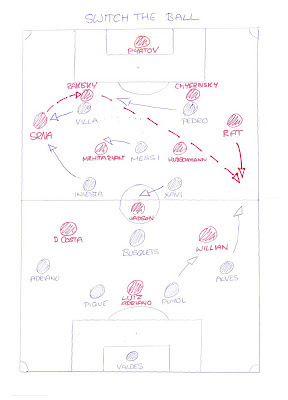 In the first part (http://sportdw.blogspot.com/2011/03/how-to-beat-barcelona-part-1.html), I looked at how to defend against Barcelona, arguably the best team in the world at scoring goals. However, to beat Barcelona, you need to score goals yourself. 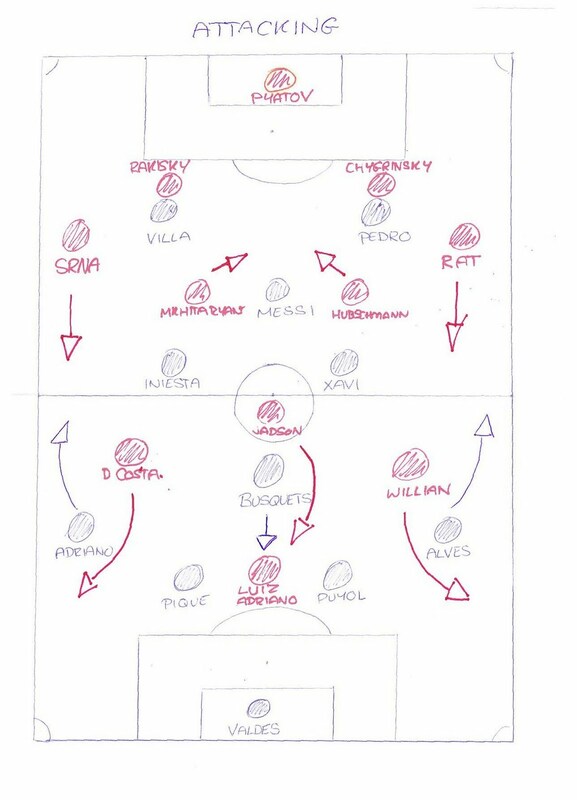 In this second part, I look at some tactics that Shakhtar could employ to test Barcelona in their Champions League tie. Even with the best defensive display, it is highly likely that Barcelona will score at least one goal. Only three teams in the past 80 matches have stopped Barcelona scoring, and in all these games, Barcelona were playing a weakened side. So, in other words, you have to attack Barcelona as well. Not only does attacking Barcelona mean that you have a chance of scoring goals, it also gives them something else to think about. However, the manner in which you launch the attacks is important. Arsenal are probably the second best passing side in world football after Barcelona, but the four matches over the past two seasons have proved that you cannot beat Barcelona in this way. Their incessant pressing game makes it virtually impossible to pass your way through them. If there were two defenders marking one of our players in one position, it meant that somewhere one of our players was free. So, we tried to find that player... Maybe he is on the other side of the field. So we tried to reach him with one ball back, instant control and a pass. Then the other winger can go. For example, if the Shakhtar right-back, Darijo Srna, has the ball, he will be closed down by the left forward, David Villa, and the left-sided central midfielder, Andres Iniesta. Lionel Messi will shift across to cover the holding midfielder and Pedro will shift across to cover the left central defender. This leaves Srna with few options. However, Shakhtar have two very good ball-playing central defenders. Both have played in midfield in their careers, so are good passers of the ball. Srna plays the ball back to his right-sided central defender, Rakitskiy. Whilst he will be under some pressure from Pedro, if he instantly controls the ball, he can shift it out to Razvan Rat on the other side of the pitch, who now has space to run forward with the ball. This will force Dani Alves to come forward to tackle Rat, leaving Willian in greater space behind him. In turn, this forces the right-sided Barcelona central defender, Carles Puyol, to come out of defence to cover him, leaving a two-on-two situation behind him with Luiz Adriano and the attacking midfielder, Jadson, up against Sergio Busquets and Gerard Pique. The other option is to play a more direct game. With the two Barcelona full-backs playing such an advanced role, it does leave plenty of space in Barcelona’s defensive third. Once you win the ball back from Barcelona, the two wider players, Douglas Costa and Willian instantly push further up the pitch to provide forward options along with Luiz Adriano. One thing that all three of these players are blessed with is pace. Once again, the tactical master that is Jose Mourinho got this exactly right in the first leg of the Champions League tie where Inter won 3-1, which could in reality have been even more comprehensive. 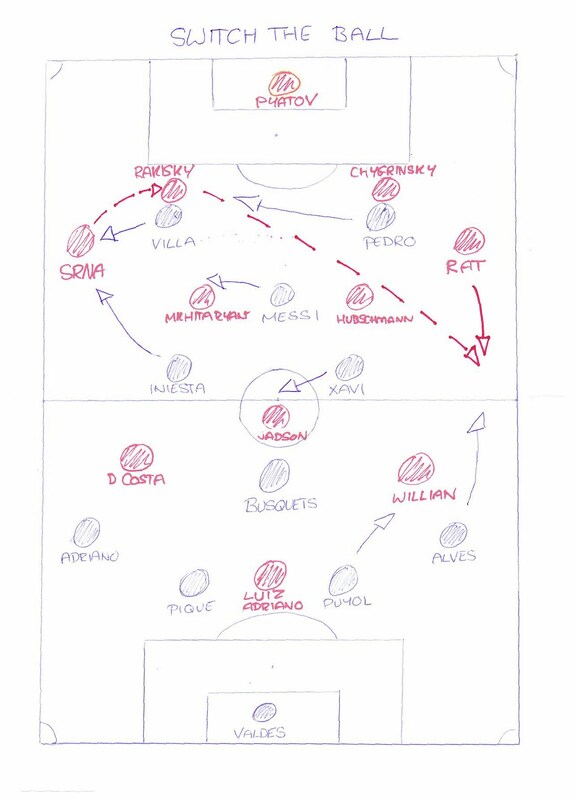 When Inter won the ball back, they immediately played long balls over the top of a high Barcelona backline. The pace and intelligence of Milito, Eto’o and Pandev caused problems and as time went on, began to lead to greater success. To compensate for this, Barcelona were forced to drop their defensive line back, creating more space in the midfield. With longer distances between players, they found it more difficult to play the quick, short passes that they have become famed for. As a result, Inter won the ball more regularly, and launched more and more counter-attacks. These longer balls not only force Barcelona to change their tactics, but they also help to relieve the pressure on the defence, and bypass the heavy pressing of Barcelona in their attacking third. One final observation about Barcelona is that Xavi and Iniesta rarely track back to the edge of their own penalty area. This often tends to leave space between the midfield and the defenders, which is only covered by Sergio Busquets. However, often Busquets has dropped deeper into the defensive line. As a result, if you can get one of the attacking trio of midfielders – Douglas Costa, Jadson and Willian – on the ball in this area, they are likely to have plenty of space to work in. Each of these three has also proven that they are very talented in shooting from range. Getting just one of these players free in this open area will almost certainly open up the option of the shot, and if they can get it right, it could be a potentially profitable avenue when it comes to trying to grab that all important goal. Barcelona are a very good outfit, but are not unbeatable. Indeed, their away record in the Champions League is actually quite poor, with only two wins in their past thirteen matches. Whilst only Inter and Arsenal have beaten them, it shows that they do not put ties to rest in the away leg. On the other hand, since moving to their new stadium, Shakhtar’s home record has been nothing short of imperious. They have won their last 22 games in all competitions at home, and haven’t lost since October 2008. The likes of Tottenham, Arsenal and Roma have all been beaten. If they can get a decent result at the Nou Camp in the first leg, they will go into the home leg with the confidence that they can get a result. Another boost for them is that their coach, the hugely experienced Mircea Lucescu, is one of only a few managers who has actually gone to the Nou Camp and won. Back in December 2008, Shakhtar beat an inexperienced Barcelona side 3-2 in the final group match. Whilst it was a weakened side, it does mean that eight of the likely starting line-up for this match have experienced winning at the Nou Camp before. Whether it will have any mental impact is yet to be seen, but who knows. However, the key to getting a result against Barcelona is organisation and discipline. Without these, whatever tactical approach you take will eventually be broken through. Each game will be one of the toughest 90 minutes, both physically and mentally, that these players will ever have been involved in. But if they can maintain their discipline, work-rate and organisation, anything is possible. The legendary Italian coach, Arrigo Sacchi, once ran an exercise in training with his wonderful AC Milan side. He took his five defenders and put them up against ten of his best attacking players, including the likes of Gullit, van Basten, Rijkaard, Ancelotti and Donadoni. The fifteen minute match ended goalless. It showed that even against greater numbers and against some of the best attacking players of a generation, a small number of organised players can hold out against all odds. This is exactly what Shakhtar will have to do. Organisation, discipline and hard-work. And possibly, against all odds, they can spring one of the biggest surprises in Champions League history. Loved your analysis...Do you coach.